Liz got on the 2020 warpath too early. Massachusetts Sen. Elizabeth Warren dodged questions on Monday about her biggest political liabilities as she jumped headfirst into the 2020 Democratic presidential primary process. 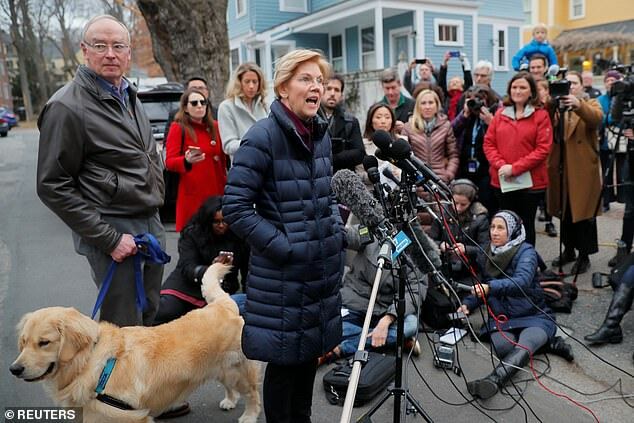 In announcing the formation of a presidential exploratory committee, Warren staked out the first significant territory in what will likely be a crowded field of Democrats itching for a swing at Donald Trump. But she showed no sign she’s ready to overcome the self-inflected scandal that has dogged her for years: her questionable claim of American Indian ancestry. The result was an unsteady performance that none of the three major cable news networks broadcast live from beginning to end. Asked in her first question as a candidate-in-waiting how she will respond to Democrats who worry that her slow-motion ancestry gaffe had left her too vulnerable to be electable, Warren defaulted to talking points. ‘I’m in this fight because I understand what’s happening to working families,’ she said outside her home near Boston, standing alongside her husband Bruce Mann. President Donald Trump has long been critical of Warren for claiming to have Cherokee ancestry, a move the president claims gave her preferential treatment in university hiring at Harvard and the University of Pennsylvania. He brought up the issue in an interview with Fox News to be broadcast New Years’ Eve. ‘Elizabeth Warren will be the first,’ Trump told the network. ‘She did very badly in proving that she was of Indian heritage. That didn’t work out too well. I think you have more than she does, and maybe I do too and I have nothing,’ the president told interviewers Pete Hegseth and Lisa “Kennedy” Montgomery. ‘So, we’ll see how she does, I wish her well, I hope she does well, I’d love to run against her,’ Trump said.